RCB tried hard but it was too hard to defend at the Wankhede. The Royal Challengers Bangalore (RCB) were back to normal again. They succumbed to their seventh loss of the season and are more or less out of the equation to qualify for the playoffs. Defending 172 at the Wankhede against the Mumbai Indians (MI) wasn’t an easy task by any means. RCB tried hard but it is literally impossible to defend with so much sweat and the small boundaries as MI got over the line. The chase began on a spectacular note for the Mumbai Indians. Their openers Rohit Sharma and Quinton de Kock went hard at RCB’s new ball bowlers to add 70 runs in just seven overs. However, the introduction of spinners turned the game on its head. Moeen Ali bowled a ripper of a delivery to castle Rohit while Quinton de Kock was also dismissed in the same over. Ishan Kishan and Suryakumar Yadav made amends then. The duo didn’t bog down with the extraordinary turn out of the surface. The former stepped out of his crease to launch the spinners Pawan Negi and Ali out of the ground. Surya also did the same to keep the run-rate in check. Though both the batsmen got out, the required run-rate was always under control for MI. Krunal Pandya played an extremely scratchy knock of 11 off 21 deliveries which turned the equation again tough for MI. But Hardik Pandya came out to bat and won it easily for the umpteenth time for his team. RCB bowled better at the death again but Kohli’s gamble to hand the ball to Negi with 25 needing off the last two overs didn’t pay off. Hardik literally smacked him with authority to end the game in the same over as MI registered their fifth win of the season. Virat Kohli failed to deliver on the day as he was snaffled by Jason Behrendorff early in the innings. Parthiv Patel slammed a few quick runs but was dismissed soon after the powerplay. The RCB had to then rebuild thanks to AB de Villiers and Moeen Ali. The duo played safely even as the former was really lucky to survive the whole spell of Rahul Chahar, the leg-spinner. Once he got settled, the South African superstar unleashed his 360-degree shots off Lasith Malinga. He and Moeen both scored a half-century and stitched 95 runs for the third wicket stand to keep the team in the game. But once the partnership was broken, all hell broke loose for the visitors. AB de Villiers tried to hog the strike and played a couple of big shots. But he needed to stay until the end. 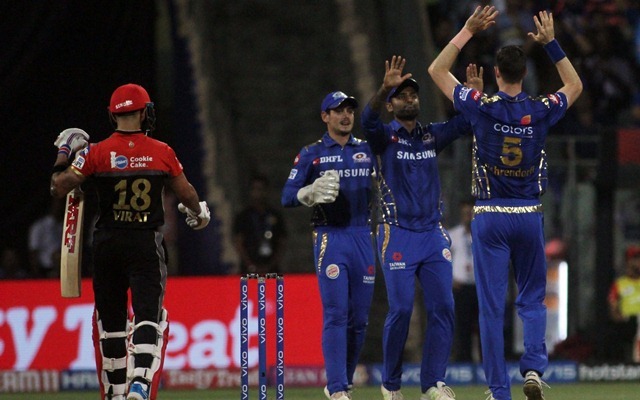 His mix-up with Akshdeep Nath in the last over led to De Villiers getting run-out and the RCB could add only a couple more runs to the total to end up on 171 runs for the loss of seven wickets after 20 overs. The score eventually didn’t prove enough and ABD’s another masterclass went in vain. When someone in commentary says about RCB chances in Playoffs.